Effective Relief of Bothersome Allergy Symptoms like Sneezing, Runny nose and itchy, water eyes. NEW! 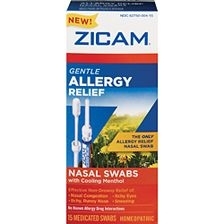 Allergy gel swabs provide soothing relief of common allergy symptoms. These unique swabs allow for gentle application of our proprietary allergy gel in sensitive nasal passages. Each box contains 15 individually wrapped swabs allowing for sharing among family members. The use of individual swabs by more than one person may spread infection. If pregnant or breast-feeding, as a health professional before use. Hold tube between thumb and forefinger at the blue band. With the other hand hold at base of handle and snap open tube. Apply medication just inside first nostril. Press lightly on the outside of first nostril for about 5 seconds. Re-dip swab in tube. Apply medication to second nostril. Press lightly on the outside of second nostril for about 5 seconds. Do not insert swab more than 1/4" past nasal opening. Wait at least 30 seconds before blowing nose. Use one tube every 4 hours. Children under 6 years of age: Consult a doctor before use.